"Our new patio looks spectacular, it’s because of Miguel’s attention to all the little details, from beginning to end. We couldn’t be happier." 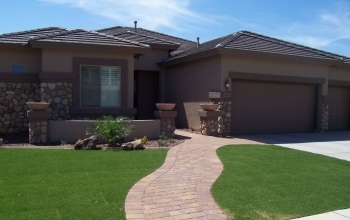 "Miguel's landscaping was very dependable, always on time, and a joy to work with." "Our front and back yards look stunning, and we can’t wait to start our next project!" Our team will help you design and create the garden of your dreams, from start to finish. We specialize in all areas of landscaping including: irrigation, water features, patios, ramadas, built-in BBQ’s and fire places. Our professional crew can handle any job big or small. Call today and ask for a free estimate. We have been serving the East Valley since 1999. The staff and crew have many years experience in the industry, and we are licensed, bonded and insured. We will work with you from the design phase through the implementation and we guarantee all our work.